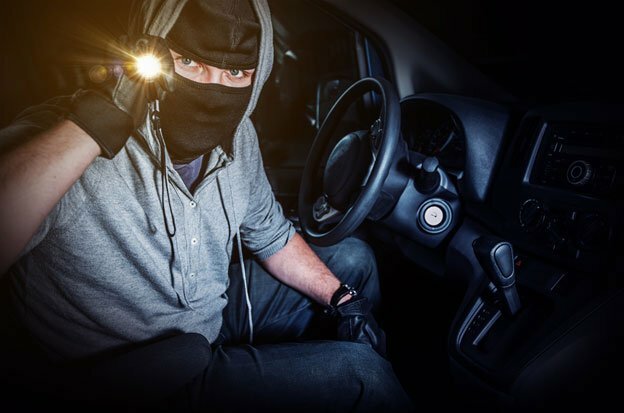 Did you know that in the U.S., nearly every 44 seconds someone falls prey to an auto thief? Nearly 50% of those thefts could be prevented by following a few simple tasks. Many may seem obvious, but since we never think that it could happen to us, it’s good to be reminded! Don’t leave your keys in the ignition or cup holder. No brainer, right? Then why are we still doing this? Even if you have a keypad entry, a car thief won’t hesitate to break a window if they see your keys waiting for them. Lock your car. Even if it’s in your driveway in the safest of neighborhoods or perhaps you are just running into the convenience store for a quick second, lock your car! Roll up your windows. Are you fortunate enough to be sporting a convertible? Secure the top. It might be hot when you first get in your car, but it’s better to have a car to get into. Park smart. You might have a beautiful and expensive ride, and feel if you park it away from other vehicles you are less likely to get door dings, however it’s more likely to get stolen. Park near lights, cameras, and security if that’s an option. A ding is still easier to repair than a stolen car. Keep it off the street. Even if you have to invest in a garage rental space, you should keep your car off the street. The harder it is to get to, the less likely someone else will drive off with your car. Lock your car while behind the wheel. Carjackers aren’t afraid to hop in the car or drag you out of the way. Invest in a kill switch. Are you driving an expensive ride or one high in intrinsic value? While a kill switch is not a cheap deterrent, it could be worth the investment. Drive a manual. Believe it or not, most drivers in the U.S. don’t know how to drive stick, and that applies to your average, everyday car thief. Install an anti-theft system. Car thieves are generally looking for an easy hit. Even just having the sticker on your car could be the necessary deterrent. Lock your car. Press that lock latch even if all you’re doing is going to pay for gas. Carjackers look for this opportunity. Did we mention keep your vehicle locked at all times? Ah, yes. Three times actually. Just wanted to make sure we hit that one home for you! This is a compilation of some of the most basic ways to keep from being a statistic. Stay smart, stay safe! We hope these tips are helpful to you. If you need quality collision repairs, call us at 419.841.2525 or stop by the shop Monday through Friday between 8 am to 5 pm, 7939 W Central Avenue, Toledo, OH 43617.